I decided that today was a good day to go eat Chinese food (truly, I think any day is a good day to eat Chinese food, but that is another story). This is the fortune that was in my cookie at lunch today. Okay, so I am capable of extremely hard work, but it doesn't say anything about my attitude about it. "Copyright laws were amended to allow customers to unlock the software on their cellphones so they can take their phones with them from wireless carrier to wireless carrier." Rumor has it that you can see this trailer when you go to see the movie Happy Feet which is on my list to go and see tomorrow. Update: This same Harry Potter trailer can be seen before the Happy Feet movie. A side note - Happy Feet is well worth the price of admission it is absolutely adorable and gives you that warm fuzzy feeling while watching it. I really have loved the Apple commercial campaign "Hi, I'm a Mac..." that they have going on right now. But I couldn't imagine even Apple going to these lengths to get people into their stores. This new (not sure it is really real) commercial from Nintendo is just too funny for words: Link. The commercial (for those of you still reading that didn't already click) is Playstation 3 vs. the Nintendo Wii done in Apple style. One very excellent commercial! This is just what I always needed, pubic hair coloring in various shades. 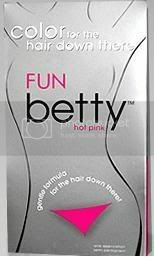 You can buy your very own bottle on the Betty Beauty website. I don't even know where to begin on this product. I think I will just leave it to your imagination. As found on Strange New Products. Out of necessity more than anything else, I have now upgraded to the new iPod Video 80gb. I have been whining about the lack of space on it for a couple of months now and my life-partner decided that it was time she made the whining stop and purchased me a new one at my favorite place to window shop - The Apple Store. My previous iPod a 4th generation 40gb version was lacking in one small detail - enough space for my music collection. I will now begin the wonderfully lengthy process of transferring all of my music files from one iPod to another. Most people think it is a fairly simple process, and overall they are right. However, when you have 40+gb of music (my entire CD collection transferred over to mp3), then it is no small affair. I'll keep you posted on the progress.